During the notoriously hectic schedule of Fashion Week, a tranquil, meditative space is often all that is wanted. The Harrys of London SS18 presentation gave us exactly that space, but also so much more. The first section of the vaults replicated the busy London cityscape. Underfoot was road; around the walls was the Westminster skyline; and the whole effect was completed with a moving, scaled-down replica of the London Eye. 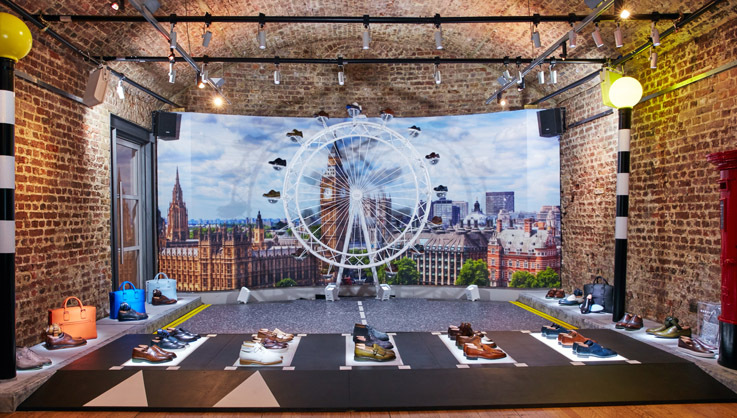 In place of pods, however, the two London-centric collections were on display. The CONTEMPORARY LONDON range this season contains classic silhouettes with a peep of colour. A new double layer EVA-Rubber sole has been incorporated in shades of blue and red, meaning you’re forever ready to either work or play. For that hard-line board meeting, however, The London Capsule is the range you need. There are new styles such as MATT, an interesting hybrid between a slip-on and an oxford, but the old favourites, the CHARLES and CHRISTOPHER, are still there. Although the shoes look serious and sleek, they are fitted with 3D Technogel® and rubber soles, ensuring your comfort throughout a demanding day in the city. The next alcove resembled the interior of an aeroplane in order to showcase items from the Made to Fly capsule collection. The shoes are next-level travel footwear and the three style options are the JET MOC, the JET SNEAKER, and the JET SLIPPER. All three include snazzy rubber pads that support the foot and none of them contain any metal, thereby ensuring swift movement through airport security. 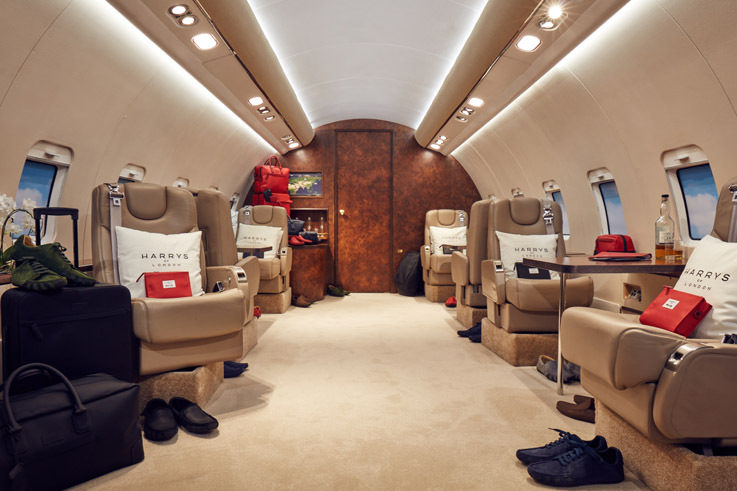 For those of you who abhor shoddy inflight socks, look no further than Harrys’ JET SOCKS. 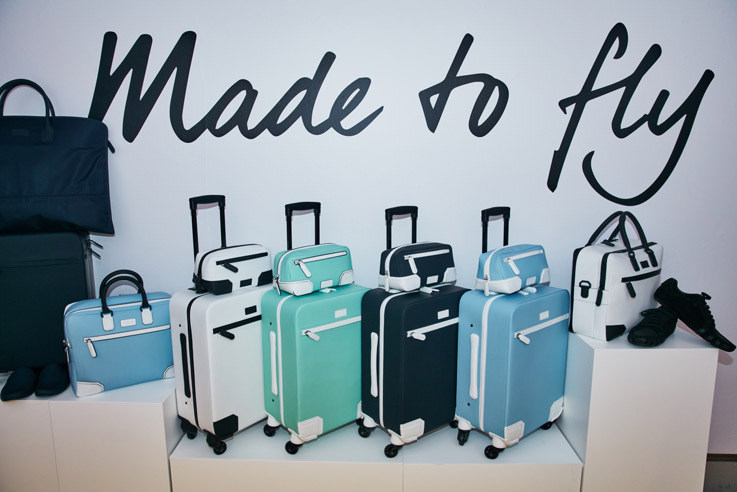 The luggage options are beautiful as well as practical, with a variety of different styles ranging from a small travel-size wash-bag to a large check-in suitcase. The brand’s signature water- and scratch-resistant leather features heavily, but a new fabric is the durable, lightweight, and rain-resistant nylon WHIPCORD fabric. The final vault was the peaceful sanctuary we’d been journeying towards. 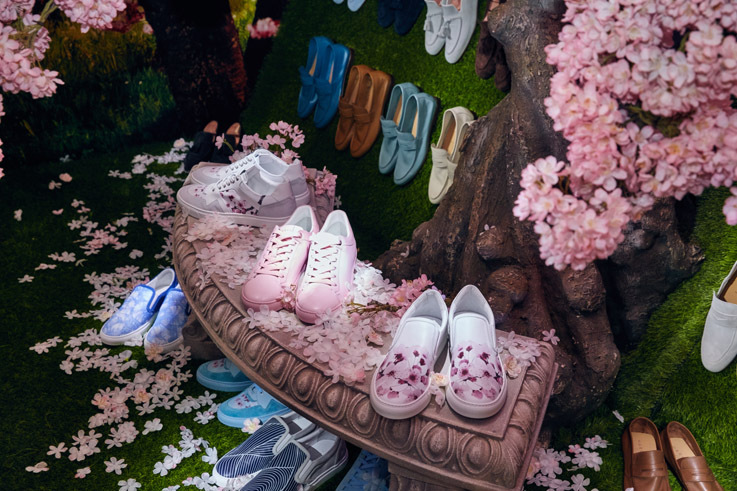 Stepping out of the aeroplane and into paradise, guests were greeted with shoes from the SNEAKERS and CASUAL ranges, which were placed under the shade of a cherry blossom and against the backdrop of a virtual waterfall. A cherry blossom motif and a wave silhouette feature on some styles but the most relaxed and simplistic sneaker is TOM, a lace-up which appears in eight pastel colours, including a beautiful dusty pink. The loafers from the CASUAL range are crafted in slightly deeper colours and the bright turquoise pair is a particular stand out. The choice of inspiration was a risky one as Harrys of London based this part of their SS18 collection around the sakura and water. The former symbolises the fragility and the ephemeral nature of life and the latter is believed to have life-giving properties. Despite its distinctly Japanese influence, this collection managed to stay away from clichés and was instead a modern and thoughtful interpretation of a much-revised trope. All in all, this presentation felt less like a Fashion Week event and more like a personal journey towards inner peace. 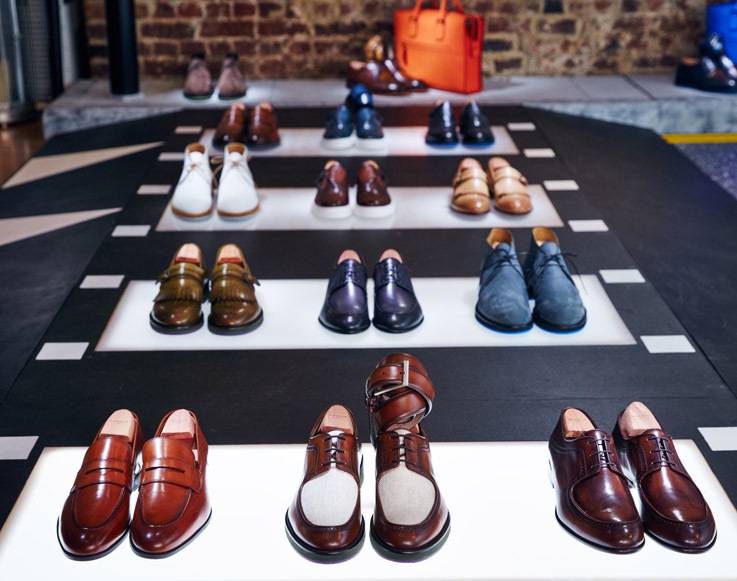 As guests moved from city, to air, to expansive nature, we were greeted with shoes that fit beautifully with each theme and that would fit seamlessly into any modern man’s wardrobe.